Philip V (Spanish: Felipe V, French: Philippe, Italian: Filippo; 19 December 1683 – 9 July 1746) was King of Spain from 1 November 1700 to his abdication in favour of his son Louis on 14 January 1724, and from his reaccession of the throne upon his son's death on 6 September 1724 to his own death on 9 July 1746. Before his reign, Philip occupied an exalted place in the royal family of France as a grandson of King Louis XIV. His father, Louis, Grand Dauphin, had the strongest genealogical claim to the throne of Spain when it became vacant in 1700. However, since neither the Grand Dauphin nor Philip's older brother, Louis, Duke of Burgundy, could be displaced from their place in the succession to the French throne, the Grand Dauphin's maternal uncle (Philip's granduncle) King Charles II of Spain named Philip as his heir in his will. It was well known that the union of France and Spain under one monarch would upset the balance of power in Europe, such that other European powers would take steps to prevent it. Indeed, Philip's accession in Spain provoked the 13-year War of the Spanish Succession, which continued until the Treaty of Utrecht forbade any future possibility of unifying the French and Spanish thrones. Philip was the first member of the French House of Bourbon to rule as king of Spain. The sum of his two reigns, 45 years and 21 days, is the longest in modern Spanish history. Philip was born at the Palace of Versailles in France the second son of Louis, Grand Dauphin, the heir apparent to the throne of France, and his wife Maria Anna Victoria of Bavaria, Dauphine Victoire. He was a younger brother of Louis, Duke of Burgundy, the father of Louis XV of France. At birth, Philip was created Duke of Anjou, a traditional title for younger sons in the French royal family. He would be known by this name until he became the king of Spain. Since Philip's older brother, the Duke of Burgundy, was second in line to the French throne after his father, there was little expectation that either he or his younger brother Charles, Duke of Berry, would ever rule over France. Philip lived his first years under the supervision of the royal governess Louise de Prie, and was after that was tutored with his brothers by François Fénelon, Archbishop of Cambrai. The three were also educated by Paul de Beauvilliers. In 1700 King Charles II of Spain died childless. His will named as successor the almost 17-year-old Philip, grandson of Charles' half-sister Maria Theresa, the first wife of Louis XIV. Upon any possible refusal, the crown of Spain would be offered next to Philip's younger brother, the Duke of Berry, then to the Archduke Charles of Austria, later Holy Roman Emperor Charles VI. Philip had the better genealogical claim to the Spanish throne, because his Spanish grandmother and great-grandmother were older than the ancestors of the Archduke Charles of Austria. However, the Austrians maintained that Philip's grandmother had renounced the Spanish throne for herself and her descendants as part of her marriage contract. The French claimed that it was on the basis of a dowry that had never been paid. On 2 November 1701 the almost 18-year-old Philip married the 13-year-old Maria Luisa of Savoy, as chosen by his grandfather King Louis XIV, by then an old man of 63. She was the daughter of Victor Amadeus II, Duke of Savoy, and Philip's second cousin Anne Marie d'Orléans, also the parents of the Duchess of Burgundy, Philip's sister-in-law. There was a proxy ceremony at Turin, the capital of the Duchy of Savoy, and another one at Versailles on 11 September. Maria Luisa proved very popular as Queen of Spain. She served as regent for her husband on several occasions. Her most successful term was when Philip was away touring his Italian domains for nine months in 1702, when she was just 14 years old. On entering Naples that year he was presented with Bernini's Boy with a Dragon by Carlo Barberini. In 1714, Maria Luisa died at the age of 26 from tuberculosis, a devastating emotional blow to her husband. Portrait of Philip V of Spain exhibited upside down in the Museum of Almodí, Xàtiva, for having burned the city in 1707. The actions of Louis XIV heightened the fears of the English, the Dutch and the Austrians, among others. In February 1701, Louis XIV caused the Parlement of Paris (a court) to register a decree that if Philip's elder brother, the Petit Dauphin Louis, died without an heir, then Philip would surrender the throne of Spain for the succession to the throne of France, ensuring dynastic continuity in Europe's greatest land power. However, a second act of the French king "justified a hostile interpretation": pursuant to a treaty with Spain, Louis occupied several towns in the Spanish Netherlands (modern Belgium and Nord-Pas-de-Calais). This was the spark that ignited the powder keg created by the unresolved issues of the War of the League of Augsburg (1689–97) and the acceptance of the Spanish inheritance by Louis XIV for his grandson. Almost immediately the War of the Spanish Succession began. Concern among other European powers that Spain and France united under a single Bourbon monarch would upset the balance of power pitted powerful France and weak Spain against the Grand Alliance of England, the Netherlands and Austria. Inside Spain, the Crown of Castile supported Philip of France. On the other hand, the majority of the nobility of the Crown of Aragon supported Charles of Austria, son of Holy Roman Emperor Leopold I and claimant to the Spanish throne by right of his grandmother Maria Anna of Spain. Charles was even hailed as King of Aragon under the name Charles III. The war was centred in Spain and west-central Europe (especially the Low Countries), with other important fighting in Germany and Italy. Prince Eugene of Savoy and the Duke of Marlborough distinguished themselves as military commanders in the Low Countries. In colonial North America, the conflict became known to the English colonists who fought against French and Spanish forces as Queen Anne's War. Over the course of the fighting, some 400,000 people were killed. It was with this war as a backdrop that, beginning in 1707, Philip issued the Nueva Planta decrees, which centralized Spanish rule under the Castilian political and administrative model and in the process abolished the charters of all independently administered kingdoms within Spain—most notably the Crown of Aragon, which was supporting Charles VI in the conflict—except for the Kingdom of Navarre and the rest of the Basque region, who had supported Philip in the war for the Spanish throne, and retained their semi-autonomous self-government. The policy of centralization had as model the French State under Louis XIV and was strongly supported by politicians such as Joseph de Solís and the Sardinian-born political philosopher Vicente Bacallar. At one point in 1712 Philip was offered the choice of renouncing the throne of Spain so that he could be made heir of France, but he refused. 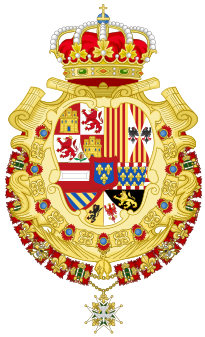 Philip decided to relinquish his right of succession to France under one condition: the introduction of semi-Salic law in Spain. Under this law, the succession to the Spanish crown was limited to his entire male line before it could pass to any female, a condition of his renunciation made clear to the allies during the preliminaries of the Treaties of Utrecht. It was not until this was successfully accomplished (10 May 1713) that Spain and Great Britain made their own peace terms at the second Treaty of Utrecht (annexing the new law to the Treaty). By the terms of the Treaty of Utrecht that concluded the war, Spain was forced to cede Menorca and Gibraltar to Great Britain; the Spanish Netherlands, Naples, Milan, and Sardinia to the Austrian Habsburgs; and Sicily and parts of Milan to Savoy. These losses greatly diminished the Spanish Empire in Europe, which had already been in decline. Throughout his reign, Philip sought to reverse the decline of Spanish power. Trying to overturn the terms of the Treaty of Utrecht, he attempted to re-establish Spanish claims in Italy, triggering the War of the Quadruple Alliance (1718–1720) in which Spain fought a coalition of four major powers. Phillip V was forced to sue for peace. Shortly after the death of Queen Maria Luisa in 1714, the King decided to marry again. His second wife was Elisabeth of Parma, daughter of Odoardo Farnese, Hereditary Prince of Parma, and Dorothea Sophie of the Palatinate. At the age of 22, on 24 December 1714, she was married to the 31-year-old Philip by proxy in Parma. The marriage was arranged by Cardinal Alberoni, with the concurrence of the Princesse des Ursins, the Camarera mayor de Palacio ("chief of the household") of the king of Spain. On 14 January 1724, Philip abdicated the throne to his eldest son, the seventeen-year-old Louis, for reasons still subject to debate. One theory suggests that Philip V, who exhibited many elements of mental instability during his reign, did not wish to reign due to his increasing mental decline. A second theory puts the abdication in context of the Bourbon dynasty. The French royal family recently had lost many legitimate agnates to diseases. Indeed, Philip V's abdication occurred just over a month after the death of the Duke of Orléans, who had been regent for Louis XV of France. The lack of an heir made another continental war of succession a possibility. Philip V was a legitimate descendant of Louis XIV, but matters were complicated by the Treaty of Utrecht, which forbade a union of the French and Spanish crowns. The theory supposes that Philip V hoped that by abdicating the Spanish crown he could circumvent the Treaty and succeed to the French throne. In any case, Louis died on 31 August 1724 in Madrid of smallpox, having reigned only seven months and leaving no issue. Philip was forced to return to the Spanish throne as his younger son, the later Ferdinand VI, was not yet of age. Philip helped his Bourbon relatives to make territorial gains in the War of the Polish Succession and the War of the Austrian Succession by reconquering Naples and Sicily from Austria and Oran from the Ottomans. Finally, at the end of his reign Spanish forces also successfully defended their American territories from a large British invasion during the War of Jenkins' Ear (1739–1748). During Philip's reign, Spain began to recover from the stagnation it had suffered during the twilight of the Spanish Habsburg dynasty. Although the population of Spain grew, the financial and taxation systems were archaic and the treasury ran deficits. The king employed thousands of highly paid retainers at his palaces—not to rule the country but to look after the royal family. The army and bureaucracy went months without pay and only the shipments of silver from the New World kept the system going. Spain suspended payments on its debt in 1739—effectively declaring bankruptcy. Philip was afflicted by fits of manic depression and increasingly fell victim to a deep melancholia. His second wife, Elizabeth Farnese, completely dominated her passive husband. She bore him further sons, including another successor, Charles III of Spain. Beginning in August 1737 his affliction was eased by the castrato singer Farinelli, who, became the "Musico de Camara of Their Majesties." Farinelli would sing eight or nine arias for the king and queen every night, usually with a trio of musicians. Philip died on 9 July 1746 in El Escorial, in Madrid, but was buried in his favorite Royal Palace of La Granja de San Ildefonso, near Segovia. Ferdinand VI of Spain, his son by his first queen Maria Luisa of Savoy, succeeded him. Historians have not been kind to the king. Lynch says Philip V advanced the government only marginally over that of his predecessors and was more of a liability than the incapacitated Charles II. When a conflict came up between the interests of Spain and France, he usually favored France. However Philip did make some reforms in government, and strengthened the central authorities relative to the provinces. Merit became more important, although most senior positions still went to the landed aristocracy. Below the elite level, the inefficiency and corruption that had existed under Charles II was as widespread as ever. The reforms started by Philip V culminated in much more important reforms of Charles III. The economy, on the whole, improved over the previous half-century, with greater productivity, and fewer famines and epidemics. To commemorate the indignities the city of Xàtiva suffered after Philip's victory in the Battle of Almansa in the War of the Spanish Succession, in which he ordered the city to be burned and renamed San Felipe, the portrait of the monarch hangs upside down in the local museum of L'Almodí. In addition, after the death of the last legitimate male descendant of Philip V's elder brother Louis, Henri, Count of Chambord, in 1883, all remaining legitimate agnatic descendants of Louis XIV were henceforth descended from Philip V.
Philip V favored and promoted the Atlantic trade of Spain with its American possessions. During this Atlantic trade emerged important figures of the naval history of Spain, among which stands out the corsair Amaro Pargo. Philip V frequently benefited the corsair in his commercial incursions and corsairs: he granted a Royal order given at the Royal Palace of El Pardo in Madrid in September 1714, in which he appointed him captain of a commercial ship bound for Caracas. The Monarch also interceded in the liberation of Amaro during his detention by the Casa de Contratación of Cádiz and authorized him to build a ship bound for Campeche, which was armed in Corsica. Louis I of Spain (25 August 1707 – 31 August 1724) married Louise Élisabeth d'Orléans but had no children. Philip (2 July 1709 – 18 July 1709) died young. Infante Philip of Spain (7 June 1712 – 29 December 1719) died young. Ferdinand VI of Spain (23 September 1713 – 10 August 1759) married Barbara of Portugal but had no children. Charles III of Spain (20 January 1716 – 14 December 1788). married Maria Amalia of Saxony and had children. Infanta Mariana Victoria of Spain (31 March 1718 – 15 January 1781) married King Joseph I of Portugal and had children. Infante Philip of Spain (15 March 1720 – 18 July 1765), Duke of Parma and founder of the line of Bourbons of Parma, married Louise Élisabeth of France and had children. Infanta Maria Teresa of Spain (11 June 1726 – 22 July 1746), married Louis of France, Dauphin of France and had children. Infante Louis of Spain (25 July 1727 – 7 August 1785), known as the Cardinal Infante. Was Archbishop of Toledo, Primate of Spain and Cardinal since 1735. In 1754, renounced his ecclesiastical titles and became Count of Chinchón. In 1776, he married morganatically María Teresa de Vallabriga and had children, but without royal titles. Infanta Maria Antonia of Spain (17 November 1729 – 19 September 1785), married Victor Amadeus III of Sardinia and had children. ^ The New International Encyclopædia, p. 14. Published by Dodd, Mead and Company, 1903. ^ Durant, Will. "The Age of Louis XIV", p. 699. Simon and Schuster, New York, 1963. ^ Matthew White. "Statistics of Wars, Oppressions and Atrocities of the Eighteenth Century". Users.erols.com. Retrieved 2012-08-22. ^ Enrico Bogliolo, Tradizione e innovazione nel pensiero politico di Vincenzo Bacallar, Turin, 1987, passim (in Italian). ^ a b "Joan's Mad Monarchs Series". Archived from the original on 2009-10-27. Retrieved 2009-09-20. ^ De Paz Sánchez, Manuel; García Pulido, Daniel (2015). El corsario de Dios. Documentos sobre Amaro Rodríguez Felipe (1678-1747). Documentos para la Historia de Canarias. Francisco Javier Macías Martín (ed.). Canarias: Archivo Histórico Provincial de Santa Cruz de Tenerife. ISBN 978-84-7947-637-3. Retrieved 8 July 2016. ^ a b "Amaro Pargo: documentos de una vida, I. Héroe y forrajido" (PDF). Ediciones Idea. November 2017. p. 520. ISBN 978-8416759811. Retrieved 20 March 2018. ^ Fariña González, Manuel. "La evolución de una fortuna indiana: D. Amaro Rodríguez Felipe (Amaro Pargo)". Retrieved 10 June 2016. ^ a b c d e f g h i j k l Anselm du Guibours (1726). Histoire généalogique et chronologique de la maison royale de France [Genealogical and chronological history of the royal house of France] (in French). 1 (3rd ed.). Paris: La compagnie des libraires. ^ a b Chisholm, Hugh, ed. (1911). "Philip IV., king of Spain" . Encyclopædia Britannica. 21 (11th ed.). Cambridge University Press. ^ a b Wurzbach, Constantin, von, ed. (1861). "Habsburg, Maria Anna (Churfürstin von Bayern)" . Biographisches Lexikon des Kaiserthums Oesterreich [Biographical Encyclopedia of the Austrian Empire] (in German). 7. p. 24 – via Wikisource. ^ a b Genealogie ascendante jusqu'au quatrieme degre inclusivement de tous les Rois et Princes de maisons souveraines de l'Europe actuellement vivans [Genealogy up to the fourth degree inclusive of all the Kings and Princes of sovereign houses of Europe currently living] (in French). Bourdeaux: Frederic Guillaume Birnstiel. 1768. p. 24. ^ "Fernando VI, Rey de España (1713–1759)". Ex-Libris Database (in Spanish). Royal Library of Spain. Retrieved 18 March 2013. ^ Avilés, José de Avilés, Marquis of (1780). Ciencia heroyca, reducida a las leyes heráldicas del blasón, Madrid: J. Ibarra, (Madrid: Bitácora, 1992). T. 2, pp. 162–166. ISBN 84-465-0006-X. ^ Rauso, Francesco di. "Le monete delle due Sicilie: Coniate nella zecca di Napoli" [The coin of the Two Sicilies, Mint of Naples coins]. Brigantino – Il Portale del Sud (in Italian). Retrieved 26 July 2014. ^ "Filippo V di Borbone, 1700–1713" [Philip V of Bourbon, 1700–1713]. Rhinocoin. Retrieved 23 July 2014. Armstrong, Edward (1892). Elizabeth Farnese: "The Termagant of Spain". London, England: Longmans, Green, and Co.
Kamen, Henry (2001). Philip V of Spain: The King Who Reigned Twice. New Haven, Conn.: Yale University Press. ISBN 0-300-08718-7. Petrie, Sir Charles (1958). The Spanish Royal House. London, England: Geoffrey Bles. The Battle of Villaviciosa (11 December 1710) was a battle between a Franco-Spanish army led by Louis Joseph, Duke of Vendôme and Philip V of Spain and a Habsburg-allied army commanded by Austrian Guido Starhemberg. The battle took place during the War of the Spanish Succession, one day after a Franco-Spanish victory at Brihuega against the British army under James Stanhope. Both Philip V of Spain and the Archduke Charles of Austria claimed victory, but the number of dead and wounded, the number of artillery and other weapons abandoned by the Allied army and the battle's strategic consequences for the war confirmed victory for Philip.The battle was largely determined by the Spanish dragoons commanded by the Marquis of Valdecañas and the Count of Aguilar, which far exceeded the opposing forces. The Austrian forces retreated, pursued by Spanish cavalry, and the allied army was reduced to 6,000 or 7,000 men when it reached Barcelona (one of the few places in Spain still recognizing Charles' authority) on 6 January. Boy with a Dragon is a c.1617 white marble sculpture, now in the Getty Museum, which has owned it since 1987. It draws on the myth of the infant Hercules strangling serpents sent to kill him. It was carved by Pietro Bernini and his son Gian Lorenzo Bernini for Maffeo Barberini (later Pope Urban VIII). In 1702 Urban's grand-nephew Carlo Barberini presented the work to Philip V of Spain on the latter's entry into Naples. The descendants of Philip V of Spain, Bourbon monarch of the Kingdom of Spain, Kingdom of Naples, and Kingdom of Sicily are numerous. He had two wives; by his first wife Maria Luisa of Savoy he had two children. After the death of his first wife Philip married Elisabeth of Parma and they had children. Philip's descendants have formed a major part of history around the globe; several becoming monarchs of Spain, Portugal and Sardinia. His descendants also founded several cadet branches; the House of Bourbon-Parma in the Duchy of Parma and the House of Bourbon-Two Sicilies in the Kingdom of the Two Sicilies. This article deals with the children of Philip V and in turn their senior descendants. The Kingdom of Aragon (Aragonese: Reino d'Aragón, Catalan: Regne d'Aragó, Latin: Regnum Aragonum, Spanish: Reino de Aragón) was a medieval and early modern kingdom on the Iberian Peninsula, corresponding to the modern-day autonomous community of Aragon, in Spain. It should not be confused with the larger Crown of Aragon, that also included other territories — the Principality of Catalonia (which included the County of Barcelona and the other Catalan Counties), the Kingdom of Valencia, the Kingdom of Majorca, and other possessions that are now part of France, Italy, and Greece — that were also under the rule of the King of Aragon, but were administered separately from the Kingdom of Aragon. In 1479, upon John II of Aragon’s death, the crowns of Aragon and Castile were united to form the nucleus of modern Spain. 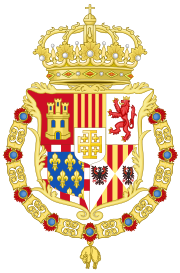 The Aragonese lands, however, retained autonomous parliamentary and administrative institutions, such as the Corts, until the Nueva Planta decrees, promulgated between 1707 and 1715 by Philip V of Spain in the aftermath of the War of the Spanish Succession, finally put an end to it. The Ambassador of the United Kingdom to Spain is the United Kingdom's foremost diplomatic representative in the Kingdom of Spain, and in charge of the UK's diplomatic mission in Spain. The official title is Her Britannic Majesty's Ambassador to the Kingdom of Spain. The British ambassador to Spain is also non-resident ambassador to the Principality of Andorra. In 1822, Foreign Secretary George Canning downgraded the Embassy to a Mission, and the Head of Mission from an Ambassador to an Envoy Extraordinary and Minister Plenipotentiary, to reflect Spain's decreased importance on the world stage. The Mission in Madrid was upgraded to a full Embassy once more on 9 December 1887. This is a list of Spanish viceroys (also called lieutenants) of the Principality of Catalonia from 1479 to 1713. 1698–1701: Jorge de Darmstadt, Landgrave of HesseDuring the War of the Spanish Succession, Catalonia was contested between the Bourbons and Habsburgs. 1713–1713: Guido StarhembergIn 1713, by the Nueva Planta decrees, King Philip V of Spain replace the function Viceroy of Catalonia, by that of Captain General of Catalonia. Not to be confused with Madonna and Child with the Infant John the Baptist (Correggio, Chicago).The Madonna and Child with the Infant John the Baptist (previously also known as The Virgin of the Sandal) is a 1518 oil on panel painting by Antonio da Correggio. Stylistically it is closest to the frescoes Correggio produced for the Camera di San Paolo and the fact that it was a model for Michelangelo Anselmi suggests that Correggio painted it in Parma. It is the work in which Leonardo da Vinci's influence on Correggio is most obvious - it forms a free variation on Leonardo's The Virgin of the Rocks. It was brought from Parma to Madrid by Isabella Farnese on her second marriage to Philip V of Spain. It was registered among her goods at La Granja in 1746 and now hangs in the Prado Museum. Maria Antonia Ferdinanda of Spain (María Antonia Fernanda; 17 November 1729 – 19 September 1785) was a Queen consort of Sardinia by marriage to Victor Amadeus III of Sardinia. She was the youngest daughter of Philip V of Spain and Elisabeth Farnese. She was the mother of the last three mainline Kings of Sardinia. Maria Luisa of Savoy (Maria Luisa Gabriella; 17 September 1688 – 14 February 1714) was a queen consort of Spain by marriage to Philip V of Spain. She acted as Regent of Spain during the absence of her spouse from 1702 until 1703, and had great influence over him as his adviser, while she was herself in turn influenced by the Princesse des Ursins. Mariana Victoria of Spain (Portuguese: Mariana Vitória; 31 March 1718 – 15 January 1781) was an Infanta of Spain by birth and was later the Queen of Portugal as wife of King Joseph I. The eldest daughter of Philip V of Spain and Elisabeth Farnese, she was engaged to the young Louis XV of France at the age of seven. Rejected due to her age, the marriage never took place and she was sent back to Spain. In 1729 she was married to Infante José, son of John V of Portugal and successor to his father as Joseph I of Portugal. She also acted as regent of Portugal during the last months of her husband's life and as advisor to her daughter, Maria I of Portugal, in her reign. New Navarre (Spanish: Nueva Navarra, Basque: Nafarroa Berria) was a province in the Provincias Internas, one of the frontier provinces of the Viceroyalty of New Spain. Brigadier Pedro de Rivera, who visited the northern presidios from 1724 to 1728, suggested to the viceroy Juan de Acuña, Marquis of Casafuerte, the political and administrative reorganization of the northwest provinces. The viceroy supported the idea, and it was approved by Philip V of Spain in 1732, and executed the following year with the appointment of the first governor, Manuel Bernal de Huidobro, at that time mayor of Sinaloa. In the branches of government, finance and war, the governor was directly subject to the viceroy, while the field of justice was under the jurisdiction of the Royal Audience of Guadalajara (Real Audiencia of Guadalajara) of the Viceroyalty of New Spain. By 1806, the province was generally recognized as Sonora or Nueva Navarra, with the capital in Arispe, and including the area comprising Sinaloa (de Iriarte, 1806). After Independence Sonora y Sinaloa became one of the constituent states of the Mexican Republic. The Sonoran Desert ecoregion covers much of the state. In the early years of European migration to Nueva Navarra, the Basques became a significant proportion of the population. The Basque immigrants reached 6% of total migrants in the first 15 years of colonization, the same percentage as those from the Castile or Extremadura, most populated regions. More specific data shows ratios between 8% and 16% of Basques in the nuclei urban settlements of those first decades, indicating a trend which would persist in the future: the Basque-Navarre preference for urban settlement (Boyde-Bowman, 1964). Philip of Spain (15 March 1720 – 18 July 1765) was Infante of Spain by birth, and Duke of Parma from 1748 to 1765. He founded the House of Bourbon-Parma, a cadet line of the Spanish branch of the dynasty. He was a son-in-law of Louis XV. Infante Philip Peter Gabriel of Spain (Spanish: Infante Felipe Pedro Gabriel de España; 7 June 1712 – 29 December 1719) was a Spanish infante as the third child and third of four sons born to King Philip V of Spain and his first queen consort, Maria Luisa of Savoy. Infante Philip Peter Gabriel was born early in the morning of 7 June 1712, at El Escorial in Madrid, the King's official residence, almost three years after the death of his elder brother and namesake, Infante Philip Peter, who had died aged sixteen days. By Christmas Day 1719, Philip was already very sick. His father arranged for his burial a few days before his death on 29 December 1719. Philip was buried in El Escorial complex. Roda de Ter (Catalan pronunciation: [ˈrɔðə ðə ˈteɾ]) is a municipality in the comarca of Osona, province of Barcelona, Catalonia, Spain, near Vic, on the Ter River above the Sau Reservoir. Population: 5,435 (2004), area: 2.18 km². Its church is dedicated to St. Peter. Main monuments: Pont Vell ("Old Bridge") and the Capella del Sòl del Pont (Chapel of Sun of the Bridge). The Virgin Mary, La Mare de Déu del Sòl del Pont is the patron of the village. On the site of an Iberian town a Roman villa was established. In its later fortified state it existed until 826, when was destroyed by Aissó, in revolt against the Frankish count Bernat of Septimania. Many years passed before it was repopulated and grew slowly. The fierce independence of the mountain people of northern Catalonia manifested itself in banditry in which villagers were encouraged to participate, even by their silence, by a share in the takings. The bandit leaders might be peasants or local noblemen. On one occasion in 1646, the whole of the village of Roda de Ter was briefly incarcerated as fautors ("abettors") for their part in sheltering members of a local gang.The Catalan fighters against the French forces of the Bourbon Philip V of Spain are an easily overlooked local part of the European War of the Spanish Succession, but Roda was a hotbed of partisans for the unsuccessful Habsburg claimant. One of them, Francesc Macià i Ambert (died 1713), who came from Roda de Ter, is memorialized in Barcelona by a street and a metro station that bear his nom de guerre Bac de Roda. Before the comarca was called simply Roda; it took the name of Roda de Ter in late 20th century when the municipality was split into Roda de Ter (the town) and Masies de Roda (the rural zone). Roda de Ter lies on Catalan route C-153. The foundry Fundiciones de Roda produced fine cast iron components for hydraulics. The Catalan poet Miquel Martí i Pol was born in Roda de Ter, March 19, 1929. Children's author Miquel Obiols is also from Roda. The Régence (French pronunciation: ​[ʁeʒɑ̃s], Regency) was the period in French history between 1715 and 1723, when King Louis XV was a minor and the land was governed by Philippe d'Orléans, a nephew of Louis XIV of France, as prince regent. Philippe was able to take power away from the Duke of Maine (illegitimate son of Louis XIV and Madame de Montespan) who had been the favourite son of the late king and possessed much influence. From 1715 to 1718 the Polysynody changed the system of government in France, in which each minister (secretary of state) was replaced by a council. The système de Law was also introduced, which transformed the finances of the bankrupted kingdom and its aristocracy. Both Cardinal Dubois and Cardinal Fleury were highly influential during this time. Contemporary European rulers included Philip V of Spain, John V of Portugal, George I of Great Britain, Charles VI, Holy Roman Emperor and Victor Amadeus II of Sardinia, the maternal grandfather of Louis XV. The Siege of Barcelona (Catalan: Setge de Barcelona, IPA: [ˈsedʒə ðə βəɾsəˈlonə]) was a battle at the end of the War of Spanish Succession, which pitted Archduke Charles of Austria (backed by Great Britain and the Netherlands, i.e. the Grand Alliance), against Philip V of Spain, backed by France in a contest for the Spanish crown. 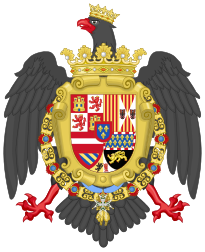 The House of Bourbon-Anjou (or simply House of Bourbon-Spain) is the reigning royal house of the Kingdom of Spain. The current Spanish royal family consists of the present king, the queen consort, their children and the king's parents. The House of Bourbon-Anjou is a branch of the House of Bourbon that descends from Philip V of Spain. The Family of Felipe V is an oil on canvas painting by the French artist Louis Michel van Loo, completed in 1743. It features life-sized depictions of Philip V of Spain and his family. The painting depicts the royal family in a fictional room and is in the style of French baroque and rococo art. The painting is one of a trio of paintings which bear the same name and are dated 1723 by Jean Ranc, a smaller 1738 version and the 1743 rendition. The Treaty of Vienna or Peace of Vienna was signed on 18 November 1738. It was one of the last international treaties written in Latin (together with the Treaty of Belgrade signed the following year). It ended the War of the Polish Succession. By the terms of the treaty, Stanisław Leszczyński renounced his claim on the Polish throne and recognized Augustus III, Duke of Saxony. As compensation he received instead the Duchy of Lorraine and Bar, which was to pass to France upon his death. He died in 1766. Francis Stephen, who was the Duke of Lorraine, was indemnified with the vacant throne of the Grand Duchy of Tuscany, the last Medici having died in 1737. France also agreed to the Pragmatic Sanction in the Treaty of Vienna. In another provision of the treaty, the kingdoms of Naples and Sicily were ceded by Austria to Duke Charles of Parma and Piacenza, the younger son of King Philip V of Spain. Charles, in turn, had to cede Parma to Austria, and to give up his claims to the throne of Tuscany in favor of Francis Stephen.